Jim & I don't normally make a big deal of birthdays, but this was one of those milestone moments -- I turned 70! Threescore and ten. I have been lucky -- even though I've had a share of toil and trouble, I (usually) have no complaints. I do seek to "count" my days so that I can not only be grateful for each of them, but use them well. I always wish I could do better, but enough thoughtfulness for now. 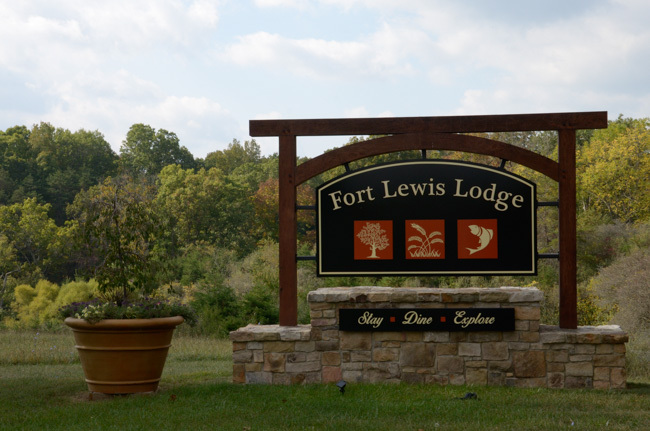 I wanted to have an out-of-the-ordinary celebration, so on the recommendation of a friend we made reservations for my "big night" at the Ft. Lewis Lodge in Bath County, VA. It was a wonderful place. Not only were the accommodations and surroundings lovely, but the other guests were delightful as well. And we had a great time getting there and coming home. Of the various routes that Google Maps proposed, we elected the one that went out VA-39 through Goshen Pass. It's hard to get a good picture of this lovely pass that the Maury River has carved through the mountains. 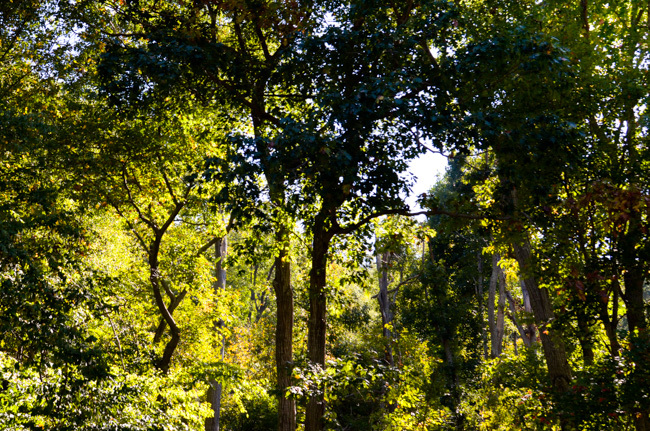 The afternoon sunlight through the trees gives an inkling of the beauty of the wooded drive. A terrible wildfire in the forest this past spring closed the road and was difficult to fight because of the steepness of much of the terrain. It swept through many acres, but didn't leave scars visible from the road. Even where the burned-over area was visible, there had been quick regrowth to mask the damage. It's not like the arid West where fire damage is manifest for years if not decades. Since we had no schedule to keep, we decided to do a little exploring. 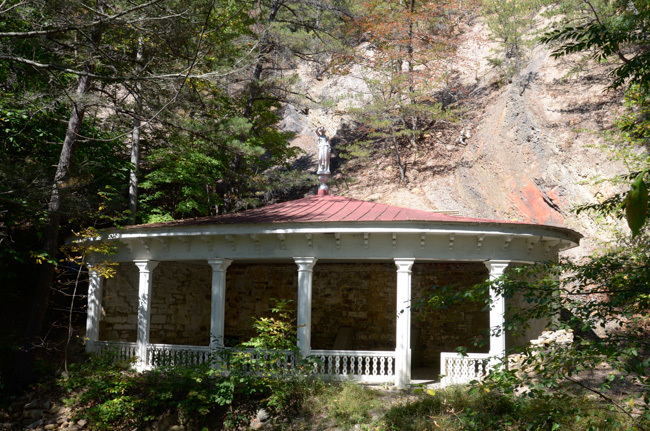 Western Virginia had been the site of several 19th century resorts boasting medicinal springs. A number of those were in Rockbridge County. Just outside the town of Goshen is a dirt road named for the Cold Sulphur Springs. There was once a hotel in this area for those "taking the waters," but I can't find any drawings or detailed descriptions. The water was described as "light tonic and adapted to the most delicate constitutions." The area is now home to a more-or-less permanent RV camp. This beautiful small lake is used for fishing. After a circuitous ramble through a variety of picturesque backcountry roads we arrived at our destination. The land had been originally surveyed by members of the Lewis family of Virginia. Charles Lewis settled here in the middle 18th century. His homestead was fortified against Indian raids, hence the "Fort" part of the name. Charles himself was killed during an engagement against the Indians in 1774, but the land remained in the family for many years. The current owners have been there since the late 1950s. My grandmother was a Lewis and the family migrated from Virginia to Kentucky in the late 18th century. Would these Lewises have been relations? Possibly, but I doubt I'll ever know for sure. The white building in the foreground is the old Lewis Mill. It now contains a bar, the dining room, and a recreation space upstairs. 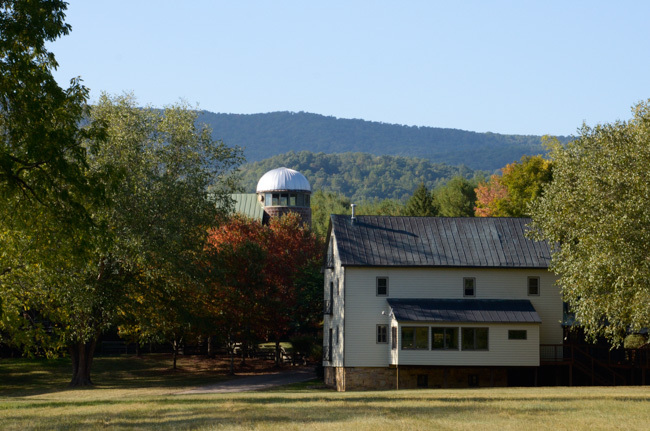 The lodge, where we stayed, is the building with the silo. Yes, there are rooms inside the silo, but we stayed in the more traditional part. In addition there are a variety of cabins situated in the area around the lodge as well as a large pavilion with a fireplace. It was a delightful place and we plan to go back (except that Jim has already checked and his birthday is booked). 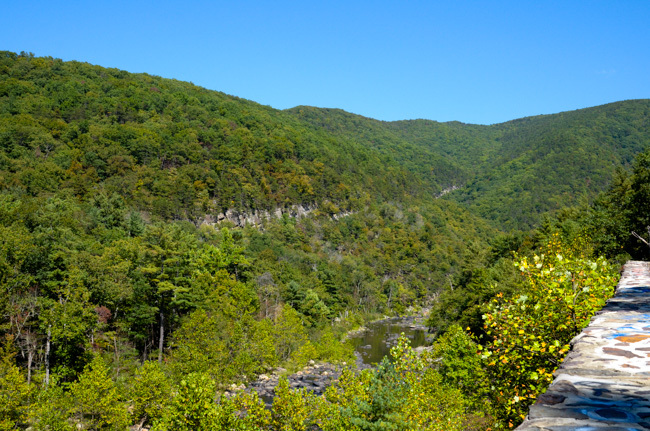 The lodge is on the banks of the Cowpasture River, which eventually joins the Jackson River to form the James. Other "pasture" rivers in the neighborhood are the Calfpasture, one of the tributaries of the Maury River, which flows through Lexington, and Bullpasture, which is a tributary of the Cowpasture. We were told that no one is sure of the source of the names, but legend aside, it's believed to have more to do with the native elk than domestic bovines. Jim by the river (really, it's behind the brush). The far side of the river was an impressive rock scarp. I could never get a good picture of it. He's showing great fortitude at not swatting at the bumper crop of gnats that swarmed around us wherever we went. 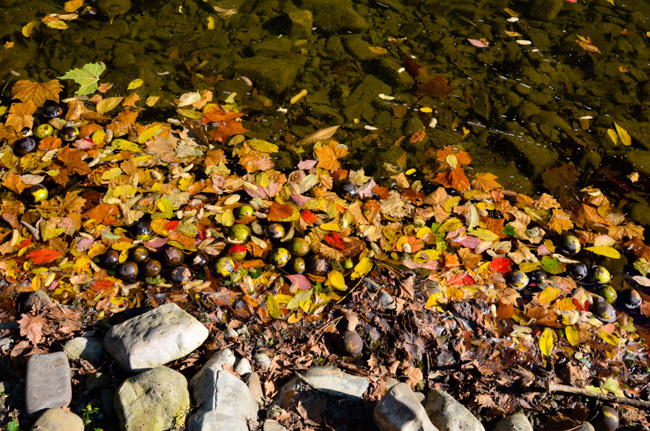 I couldn't resist the colorful leaves and black walnut husks floating alongside the river bank. The water was crystal clear. 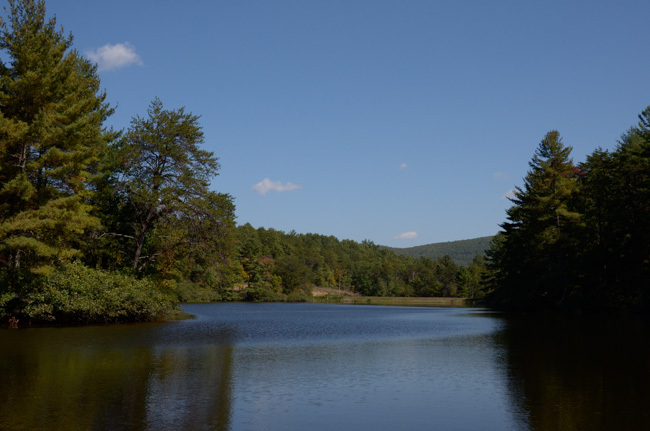 The lodge offers kayaking and swimming in the river as well as fishing. 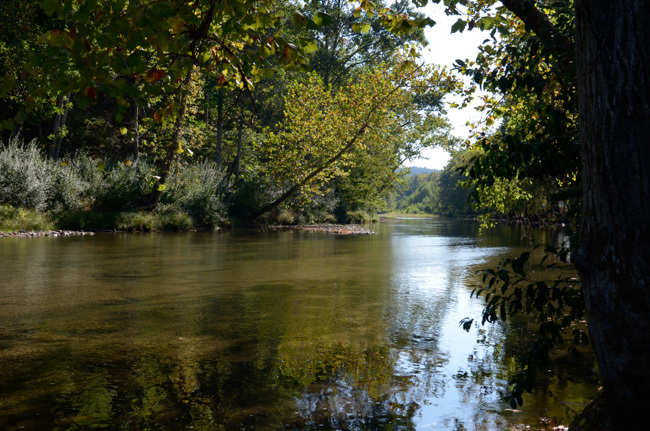 It is rare to have exclusive fishing rights to a reach of river in Virginia, but the rights were granted along with the land by King George. 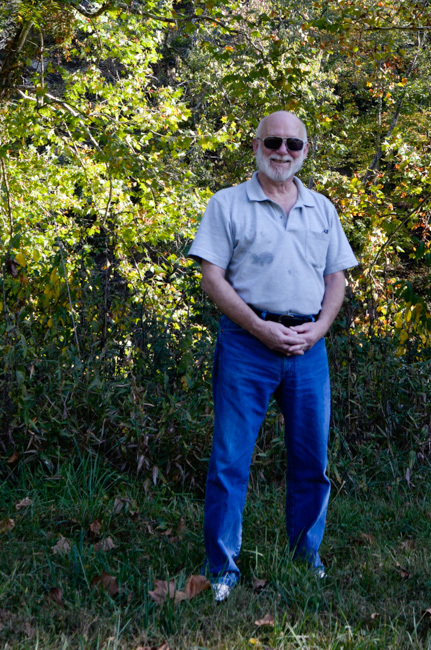 Since the land grant has remained intact for 300 years, so have the fishing rights! The sauna by the river is brand new and not yet in service. All of the river-side dock and observation decks were chained to trees to survive floods. 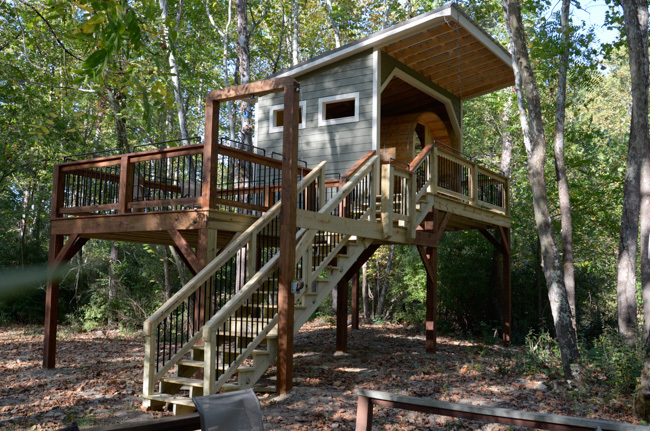 The sauna is up on stilts and the stairs can be raised above expected floodwaters by a pulley system. Not only was the room nice, the food outstanding, and the surroundings lovely, the people we met were also enjoyable. Everything is set up to encourage interaction with fellow guests and we met a number of nice folks. One couple is considering an eventual retirement destination and we gave them a hard-sell on considering Lexington. I hope we see them again someday. I had seen this sculpture as we came in and decided to take a picture on the way out. While prowling around to get a good vantage point, I walked behind it and found the clever tractor seat attachment that wasn't really visible from the driveway. A good metaphor for the place. On our return journey we took a route that would take us by the former Rockbridge Alum Springs resort, now a Young Life camp and retreat center. We knew that most of the historical buildings had been lost over the years, but still wanted to see what we could see. The staff could not have been more helpful. We were given a map and an outline of what was available and we were cleared to prowl around the campus. They said that they were more restrictive when camp is in session, of course, but we were the only visitors on this day. 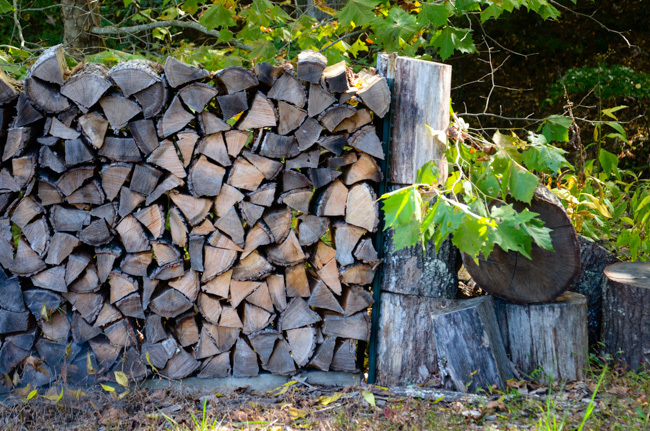 The logpile was close to our first stop. I thought it made a pretty picture. From notes at the cemetery, the resort had served as a Confederate hospital in the early days of the Civil War. 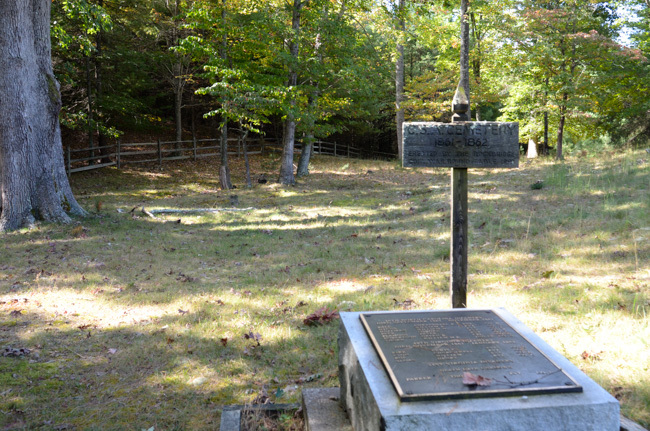 The cemetery contains at least 72 unmarked graves. Many names are listed on the plaques along with their dates of death. 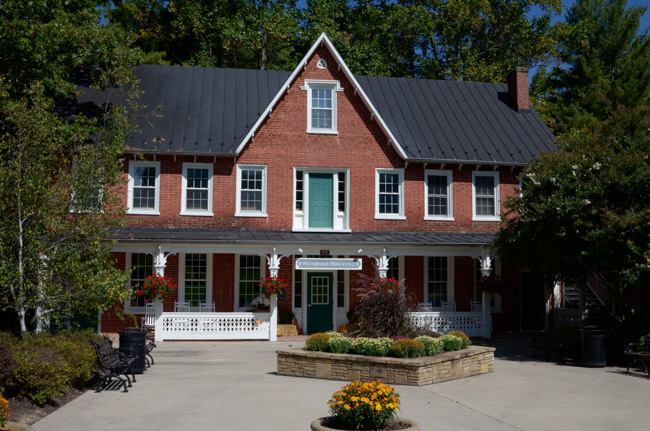 There had been two competing resorts at this location, the original Rockbridge Alum Springs resort, established in 1834, and the Jordan Alum Springs, which opened after the Civil War. The local monthly paper recently ran a series describing the fierce rivalry and suits and counter-suits between the two organizations. Although they eventually merged in 1880, business never recovered. 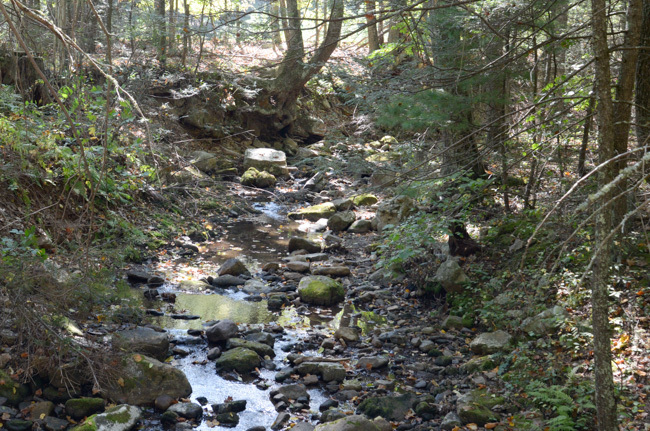 This stream is near the site of the Jordan Alum Springs Grand Hotel. I wasn't able to find any vestige of the building site. 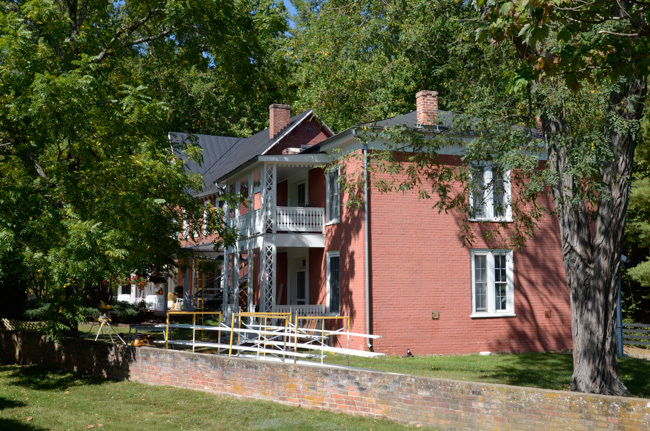 According to the nomination (file opens in separate tab) for the National Register of Historic Places, these two buildings were constructed in the 1850s. One was the post office and the other was the barroom! Adjacent to the twin buildings is a house known variously as "The Vale" and Montgomery Hall. 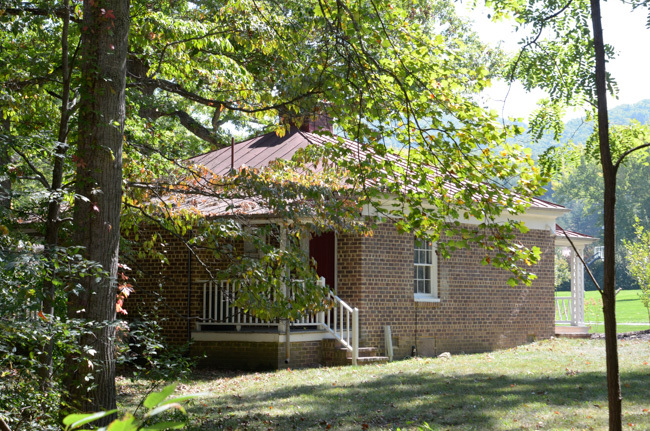 It was also built in the 1850s as a guest house. At the time of our visit, the building was undergoing structural conservation. The "Gothic Hotel" dates from the 1850s along with its neighbors. The original spring house stands across the creek from the Gothic hotel, but the access to the spring has been blocked up. The mountain is shale and is the source of the water. 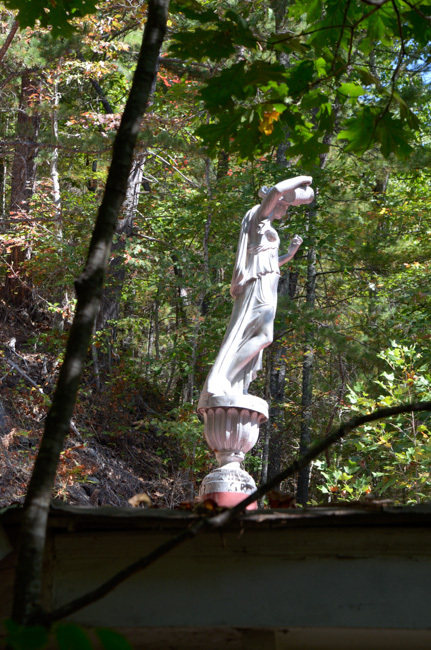 The statue atop the spring house was described to us a "a lady." According to the nomination mentioned above she represents Hygeia, the goddess of health. 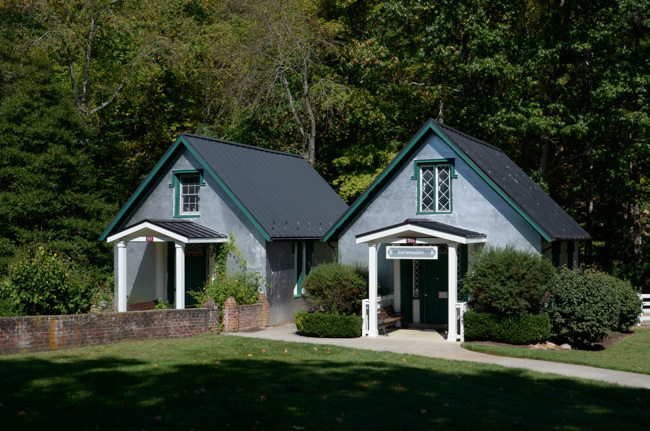 Two of the original nine guest cottages of "Baltimore Row" still remain. Originally each cottage contained four rooms, each with a separate entrance. These appear to have been modified into single dwellings. There was a similar row of cottages called "Kentucky Row" that faced these, but they are now gone. We did not see the other structures mentioned in the nomination and the map references do not match the map that is included in the online version. They may have been demolished or we may simply have not recognized them. 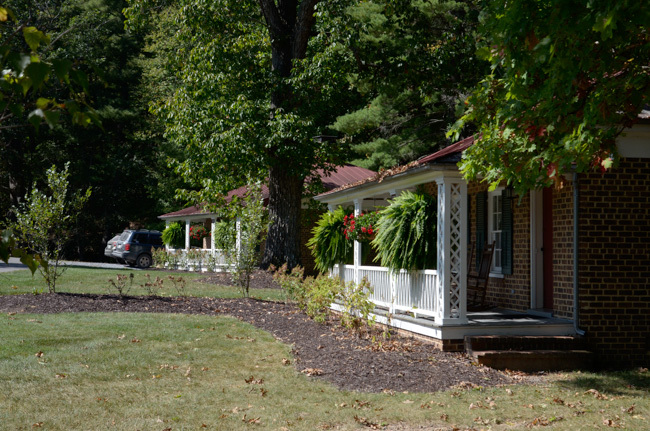 A view of one of the cottages from the spring house gives a good image of two of the original four entrances. The central chimney that could heat all four rooms is also visible. 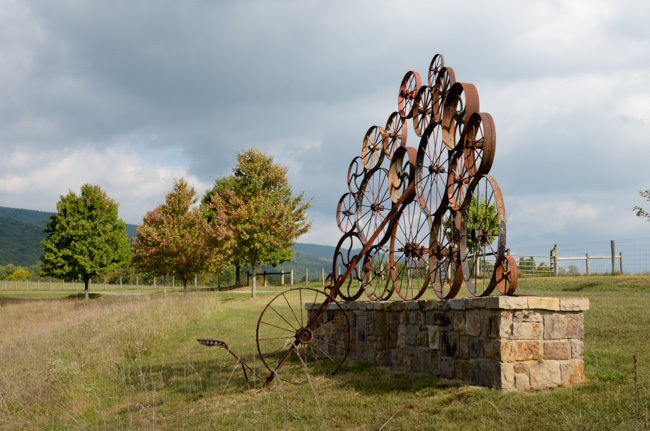 In its heyday prior to the Civil War, the resort could host over 800 guests. Times change, however, and the hotel closed in 1903. Some of the cottages remained open until 1941, when the business was liquidated and the land sold. It was a delightful birthday. Although we have traveled the world, I confess that I really prefer unstructured meandering explorations of nearby out-of-the-way places.